All cells are surrounded by a fatty acid called arachidonic acid. If this is attacked by free radicals then new compounds are formed including prostaglandin 2 and thromboxanes which promote inflammation. Allergies that affect the upper respiratory may include hay fever, allergic rhinitis. Asthmatic allergies present themselves as breathing difficulties. Other allergies may present themselves as skin irritations and rashes, loss of hair and itchiness. In some cases headshaking occurs in response to an allergen. Anti-histamines which block the release of histamines. Anti-inflammatory agents such as cortisone. Decongestants such as ephidrine, phenylpropanolamine and potassium iodide. 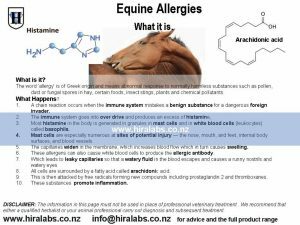 This may involve a number of things firstly to identify what may be the suspected trigger for the allergic response and secondly making a few basic changes to your horse’s feed and training regime. Start by removing all processed and pre-mixed feeds from the diet and replace with ‘simples’ the you mix and blend yourself like oaten chaff, linseeds, etc. Ensure that the pasture is free from known allergens and poisonous plants. Where possible minimise exposure to known allergens like pine pollens. Look at changing your horse pasture to the one recommended by us in our pasture page. Ensure that your horse has access to a wide biodiversity of pasture plants in particular bitters that will help stimulate and enhance the liver. These will act as natural detox herbs. Reduce the percentage of concentrates and increase soluble and insoluble fibre. This will help detoxify the hind gut. 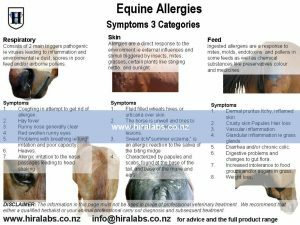 Allergies affecting the upper respiratory tract Horse radish, garlic and cabbage leaves may be added to food. 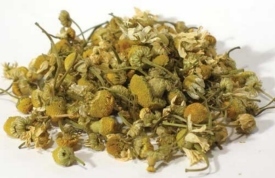 chamomile are the herbs of choice. For allergies affecting mechanical breathing difficulties herbs of choice would include gingko may prevent bronchial restriction. 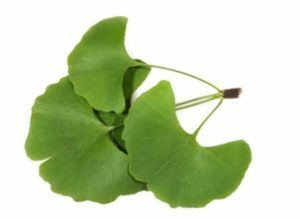 Gingko stops the cascade of archidonic acid( cell lipid) and its derivatives. In other words prevents oxidation of cell lipids. If your horse has had an allergic reaction to boxthorn feeding it with a handful of the new tips of boxthorn will reduce the lumps on the skin. Nettle, one handful daily may help relieve congestion and inflammation. Quercetin is a member of the flavonoid family which helps stabilise the cell membranes of mast cells and basophils thus preventing them from spilling their supply of histamine/seratonin into the surrounding blood and tissues. 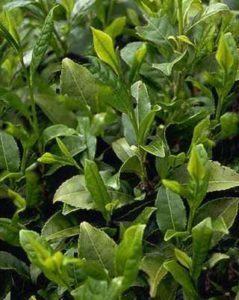 Green tea leaves as found in Camellia sinensis Onions and blue green algae are good supplies of this flavonoid. Omega Fatty acids will help increase the production of Prostaglandin E1 and E3 and suppress E3 which will help reduce inflammation. Hira Omega Oil Complex which also has vitamin C and E 15ml daily. Add to 3 litres of water the following 6 lemons with skins( rich in flavonoids) small handful of thyme, tablespoon of grated ginger, ½ tsp of cayenne pepper, one tsp of horehound, one tsp of grated licorice root. Bring to boil then when just warm add a tablespoon of manuka honey. Add one cup of this twice daily to feed. DISCLAIMER: Hira Laboratories will not be held responsible for the use or misuse of any products listed. We recommend that either a qualified herbalist or your animal professional carry out diagnosis and subsequent treatment. Herbal remedies must not be given not be taken in conjunction with other medication with out consulting a medical professional.